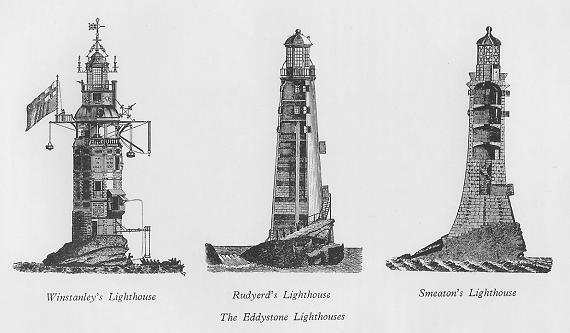 Eddystone is probably the most famous of all the UK's lighthouses and was the first in many ways. 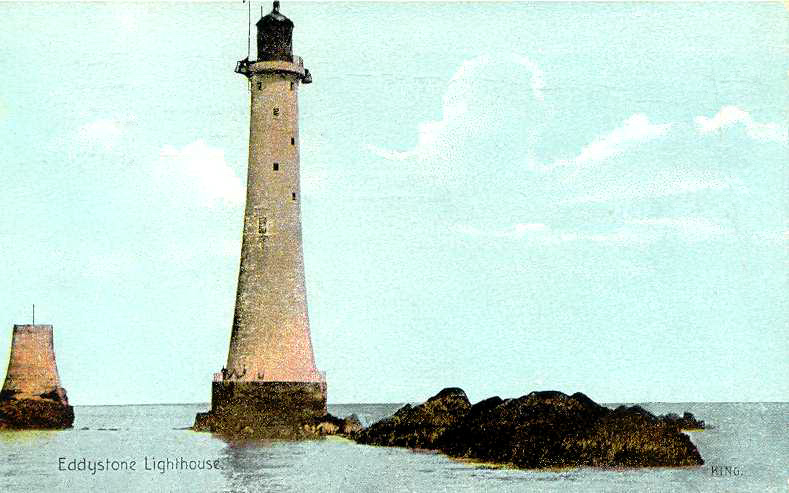 The first lighthouse to be built on a small rock in the open sea. The first to use the highly successful Seaton design. It was the first Trinity House rock lighthouse to be converted to automatic operation. 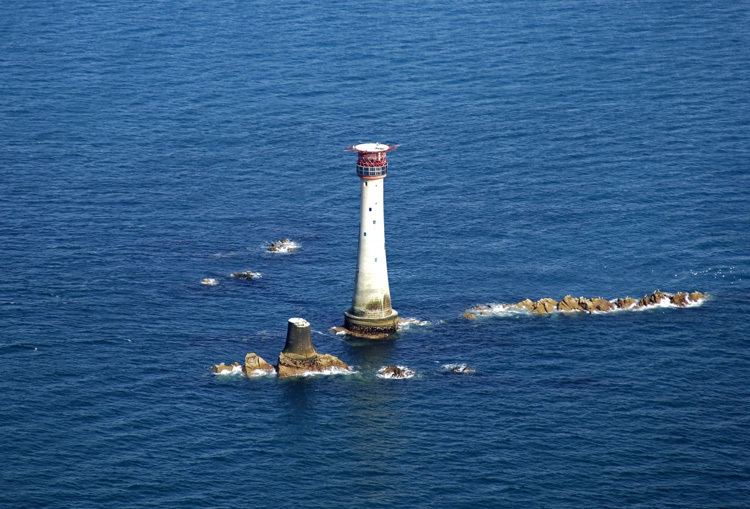 Eddystone Lighthouse is on the treacherous Eddystone Rocks, 9 statute miles (14 kilometres) south west of Rame Head, 13 miles south west of Plymouth. While Rame Head is in Cornwall, the rocks are in Devon and composed of Precambrian Gneiss. The current structure is the fourth lighthouse to be built on the site. The first and second were destroyed. The third, also known as Smeaton's Tower, is the best known because of its influence on lighthouse design and its importance in the development of concrete for building. Its upper portions have been re-erected in Plymouth as a monument, and is open to the public. The fourth and largest of the Eddystone lighthouses was completed in May 1882 amidst a blaze of publicity and, as we see, still survives today. It was founded on the actual body of the Eddystone reef some 40 yards to the south-east of Smeaton’s site and was completed in three and a half years. It was designed and built by James Douglass, Engineer-in-Chief of Trinity House and stands at 40 metres high. Over the last 60 to 70 years a number of changes have been introduced to the tower. Electric power was introduced in 1959 and a helicopter landing pad was built on the top in 1980 to enable maintenance personnel to land and carry out inspections. 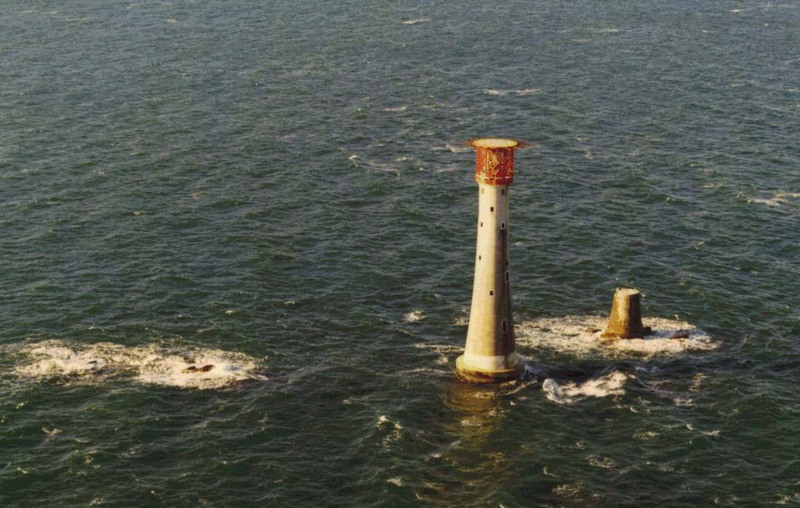 In 1982 the lighthouse became fully automatic, bringing an end to 284 years of Keepers of the Eddystone Light. It is now controlled from Penlee Point Signal Station, near Cawsand, Cornwall. Most recently, in August 1999, the electric light in the lantern began to be generated by solar panels. Today, the beam can be seen up to 17 miles away. On the left is the stub of the third lighthouse (Smeaton Tower) which was pulled down and moved. 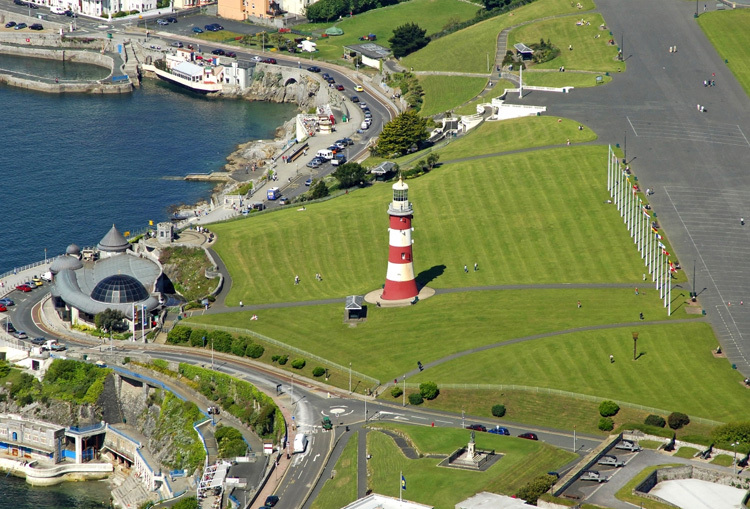 The old Eddystone (Smeaton's Tower Lighthouse ) moved to Plymouth Hoe in 1882. The first attempt to maker the Eddystone safe to shipping was by Henry Winstanley. He was an engraver, merchant ship owner and designer of mechanical waterworks. As a showman he had established "Winstanley's Waterworks" near Hyde Park which remained one of London's foremost popular attractions for decades. As a merchant he had invested money in 5 ships and when for the second time one of his ships, the ‘Constant’, was wrecked on the rocks in 1695, Winstanley promised to rid shipping of this menace. In 1696 he commenced work on an octagonal wooden structure and the work progressed steadily. England was at war with France at this time and such was the importance of the Eddystone project that the Admiralty provided Winstanley with a warship for protection on the days when work was taking place. In 1697 a most unusual incident occurred, one morning at the end of June the protective vessel did not arrive, but instead a French privateer, which carried Winstanley off to France. However when Louis XIV heard of the incident he ordered that Winstanley be immediately released saying that "France was at war with England not with humanity". The importance of the Eddystone was now international. It was first lit with 24 candles in 1698 – the first offshore light to be built in Britain. Winstanley was known as an eccentric and his lighthouse reflected this with detailed architecture including external ladders, a huge weather vane and ornamental scrollwork. 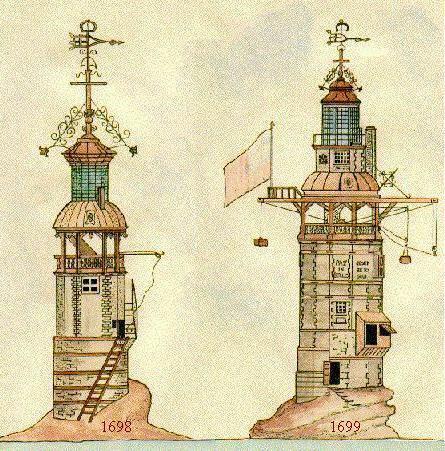 The lighthouse survived its first winter but was in need of repair in the spring of 1699, and was changed to a dodecagonal (12 sided) stone clad exterior on a timber framed construction with an Octagonal top section as can be clearly seen in the later drawings or paintings, one of which is to the right. 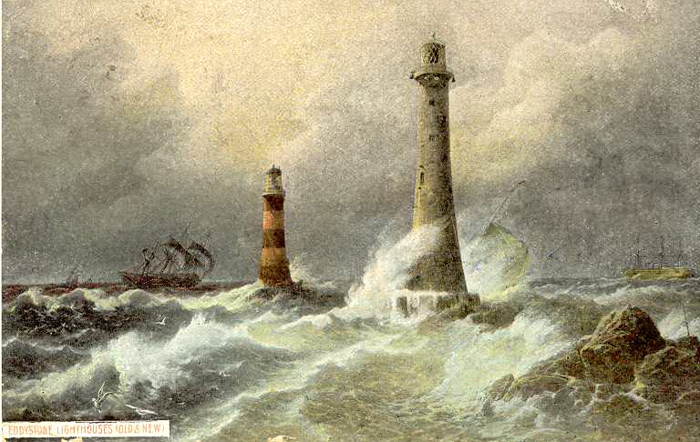 So in some ways it could be said that there have been five lighthouses on Eddystone Rock. He introduced even more elaborate features such as Latin and English inscriptions and ornamental wooden candles. Winstanley's tower lasted for three years, until the Great Storm of 1703 erased almost all trace on 27 November. Winstanley was on the lighthouse, completing additions to the structure. No trace was found of him. His lighthouse keepers also perished in the storm. The cost of construction and five years' maintenance totalled £7,814 7s.6d, during which time dues totalling £4,721 19s.3d had been collected at one penny per ton from passing vessels. Just two days after the tragedy the tobacco ship, ‘Winchelsea’, was wrecked on the reef but it would be another three years before someone was appointed to design a new lighthouse for the place where Winstanley’s once stood. Captain Lovett acquired the lease of the rock for 99 years, and by an Act of Parliament (patent charter) was allowed to charge, all ships passing, a toll of 1d per ton, both inward and outward. His designer was John Rudyerd, a Ludgate Hill, London, based silk merchant with West Country roots, who he engaged to design and build a new lighthouse for the Eddystone reef in 1706. Taking a shipbuilder's, rather than a house builder's, approach he came up with a design based on a cone instead of Winstanley's octagonal shape. He built a conical wooden structure around a core of brick and concrete and it was first lit in 1709. Another account says he used two shipwrights called Smith and Northcutt to assist him with this. That it was built from alternate courses of oak timbers and granite blocks round an oak mast and was anchored into the reef with 36 iron spikes, standing 21 metres high, it was first lit by 24 candles in 1708. This design was solid and the lighthouse lasted for 47 years, and was not destroyed by the sea but by a fire. On the night of 2 December, 1755, the top of the lantern caught fire, probably through a spark from one of the candles. Henry Hall, the keeper on watch, who was 94 years old (some accounts say 84 years old) but said to be `of good constitution and active for his years', did his best to put out the fire by throwing water upwards from a bucket. While doing so, the leaden roof melted, his mouth was open whilst looking up and some of the molten lead ran down his throat. He and the other keeper battled continuously against the fire but they could do nothing as the fire was above them all the time - as it burnt downwards it gradually drove them out onto the rock. The fire was observed from the shore by a Mr. Edwards, 'a man of some fortune and more humanity'. The old account says, he sent off a boat which arrived at the lighthouse at 10am after the fire had been burning for 8 hours. The sea was too rough for the boat to approach the rock so they threw ropes and dragged the keepers through the waves to the boat. The lighthouse continued to burn for 5 days and was completely destroyed. Henry Hall lived for 12 days after the incident, and a Dr Spry of Plymouth who attended him made a post mortem and found a flat oval piece of lead in his stomach which weighed 7ozs 5drs. This piece of lead is now in the collections of the National Museums of Scotland. Dr Spry wrote an account of this case to the Royal Society, but the Fellows were sceptical as to whether a man could live in this condition for 12 days. This so incensed him that, for the sake of his reputation, he performed many experiments on dogs and fowls pouring molten lead down their throats to prove that they could live. New drawing of the second Eddystone Lighthouse, at Plymouth, built of wood in 1709 and burned on December 2, 1755. 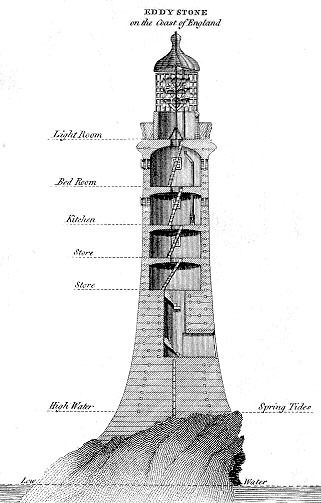 The drawing displays the lighthouse from a side view, showing the climb along the rock base to stairs. The drawing is hand-edited, not to scale, but based on reference drawings of the 2nd lighthouse, and pictures of the rock base, with a handrail darkened for effect. Smeaton's Lighthouse, the third lighthouse, marked a major step forward in the design of such structures, and for the first time on this site was the work of a leader in the civil engineering profession of his time. This is also where Trinity House became involved. After experiencing the benefit of a light for 52 years, mariners were anxious to have it replaced as soon as possible. Trinity House placed a light vessel to guard the position until a permanent light could be built. In 1756 a Yorkshireman and civil engineer John Smeaton, who had been recommended by the Royal Society, travelled to Plymouth to take on this task He had decided to construct a tower based on the shape of an English Oak tree for strength but made of granite blocks rather than wood. For such a task he needed the toughest labourers, and many of the men employed had been Cornish Tin Miners. Press ganging had become a problem amongst the workforce, so to ensure that the men would be exempt from Naval Service, Trinity House arranged with the Admiralty at Plymouth to have a medal struck for each labourer to prove that they were working on the lighthouse. John Smeaton pioneered 'hydraulic lime', a quick drying concrete that will set under water, the formula for which is still used today. He also developed a technique of securing the granite blocks using dovetail joints and marble dowels. He is also credited with coming up with a device for lifting large blocks of stone from ships at sea to considerable heights which has never been improved upon. The lighthouse had a slightly curved profile, which strengthened and gave it a low centre of gravity. Local granite blocks was used for both the foundations and exterior of his tower, and Portland stone for the inside. Construction started in 1756 at Millbay and the light was first lit by 24 candles on 16 October 1759. Smeaton’s robust tower set the pattern for a new era of lighthouse construction. Smeaton's lighthouse was 59ft (18m) high and had a diameter at the base of 26ft (8m) and at the top of 17ft (5m). In 1810 oil lamps with reflectors replaced the candles. These reflectors were then replaced with lenses in 1845, giving the tower a much better light intensity. In the 1870's cracks appeared in the rock upon which Smeaton's lighthouse had stood for 120 years. It remained in use until 1877 when erosion to the rocks under the lighthouse caused it to shake from side to side whenever large waves hit. It was also by this time too small to contain the latest machinery. Smeatons Tower, since moved, except for the base. The top half of the tower was dismantled and re-erected on Plymouth Hoe, on a new granite base, as a monument to the builder. The remaining stump, the foundations, proved too strong to be dismantled easily, so the Victorians left them where they stood and they still stand on the Eddystone Rock. The British pre-decimal One Penny Coin, obverse side, features Smeaton's Lighthouse. A replacement lighthouse was able to be planned and replacement could occur quickly. 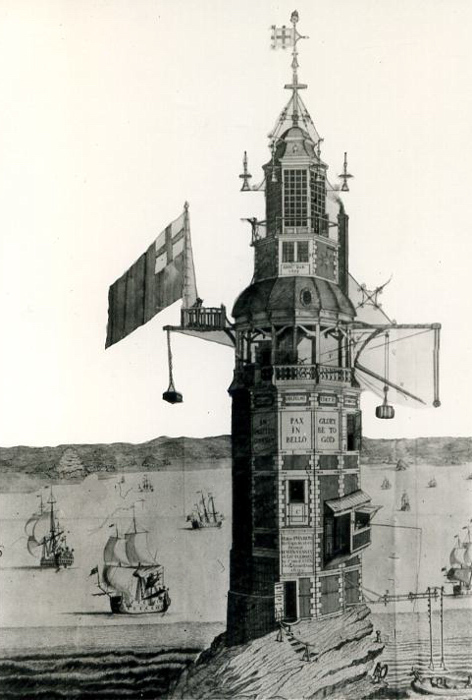 The new larger tower, 49 metres (161ft) high, was designed by James Douglass, at the time Engineer-in-Chief of Trinity House. It was founded on the actual body of the Eddystone reef some 40 yards to the south-east of Smeaton’s site. He used Robert Stevenson's developments of Smeaton's techniques. Douglass used larger stones, dovetailed not only to each other on all sides but also to the courses above and below. It was completed in three and a half years, and in 1882 the present Eddystone Lighthouse was opened amidst a blaze of publicity, by the Duke of Edinburgh, who laid the final stone of the tower. 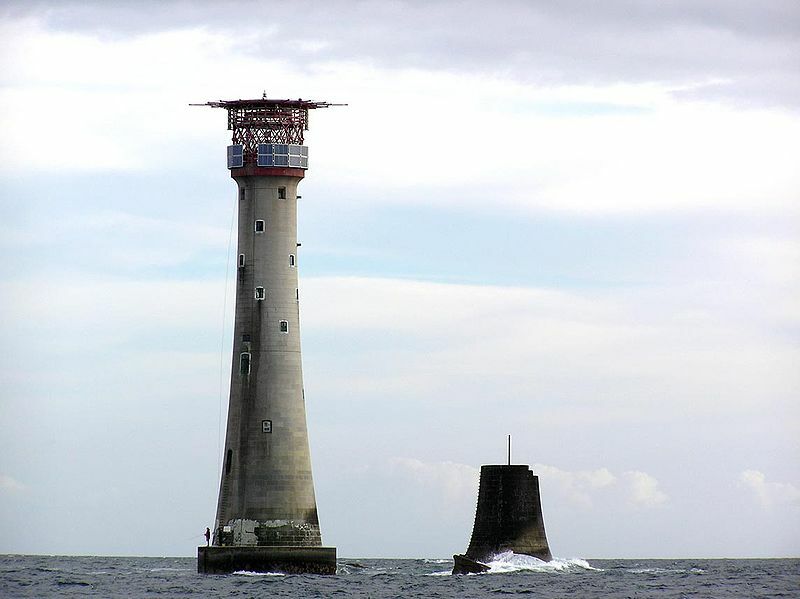 This was the first Trinity House rock lighthouse to be converted to automatic operation on 18 May 1982, 100 years to the day since the opening of Douglass's tower by the Duke of Edinburgh, bringing an end the 284 years of Keepers of the Eddystone Light. During the last 60-70 years a number of other changes have been introduced to the tower. Electric power was introduced in 1959 and a helicopter landing pad was built on the top in 1980 to enable maintenance personnel to land and carry out inspections. Most recently, in August 1999, the electric light in the lantern began to be generated by solar panels. Today, the beam can be seen up to 17 miles away. There are many paintings of this series of lighthouses and many of these together with a longer six page history can be found by clicking here. 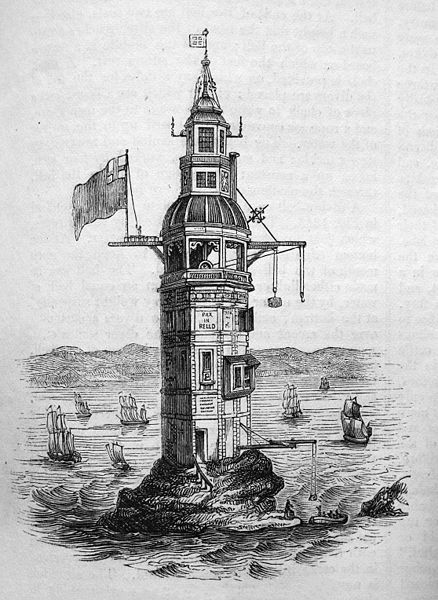 Round granite tower, incorporating keeper's quarters, with lantern and a helipad built above the lantern. Tower is unpainted grey stone, lantern and helipad painted red. In addition, a red light (5 s on, 5 s off) is shown to the northwest from a tower window at a focal plane of 28 m (93 ft).